We offer a full range of traditional English pies as well as fresh fish caught off the British coast. We offer a full range of traditional English Pies as well as fresh Fish caught off the British coast. Deep fried or pan fried in the finest groundnut oil with a thin crispy batter, baked or grilled. Accompanied with traditional hand cut chips or new potatoes, fresh seasonal vegetables or salad as a healthy alternative. The pie lies at the very heart of the Kennedy’s brand. Each pie filling is lovingly made from locally sourced produce from the British Isles, encased in fresh pastry and cooked on site, to produce a pie with homemade flavour that no mass produced pie can possibly compare to. 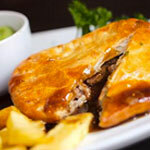 Of course, we supply the old pie favourites like steak and kidney, among our mouth-watering selection. But if you’re feeling a little adventurous, why not try our Venison and red wine pie, or our Steak and Stilton. Our unique range of fish pies including Poached Salmon in Tarragon sauce or our vegetarian option of Butternut Squash, Goats Cheese & Leek. Our pies are freshly baked throughout the day. Fish has always been a mainstay of the British cuisine and, be it plaice, cod, haddock, you won’t find a more delicious fish dish than at Kennedy’s. 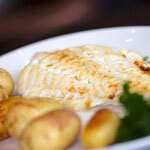 All our fish is fresh and never frozen. Deep fried in batter the traditional way is delicious, but you also have the option of trying one of the chef’s alternative creations. 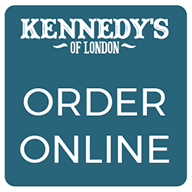 At Kennedy’s we offer a choice of sausages, Cumberland, traditional chip-shop sausages and saveloy’s. All our sausages are lovingly created from succulent portions of meat, the Cumberland is slowly char grilled to absolute perfection. 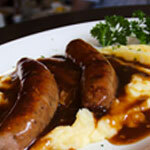 A popular main is our bangers and mash dish, which show cases the tenderness of our sausages. 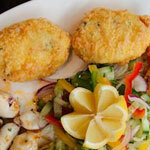 Kennedy’s fishcakes have an identity of their own. Made from generous amounts of the freshest cod, mashed potato and is seasoned with herbs, complimenting the fish with an aromatic taste. They are cooked with a light crispiness on the outside and met with appetising, textured insides. Our 8oz beef burgers are made from pure, high quality Aberdeen Steak and are an absolute delight. 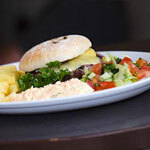 They are char grilled and served in a fresh, warm bap and salad. These delectable creations of ground steak are fortified with protein and are mouth watering when served in the style of a traditional burger in a bun. © 2019 Kennedy's London. All rights reserved.